The last 2 sisters at the Monastery of the Precious Blood on State Street will relocate next month to their religious order's monastery in Manchester, N.H. The last two nuns in a cloistered Catholic community in Portland are moving out of Maine. 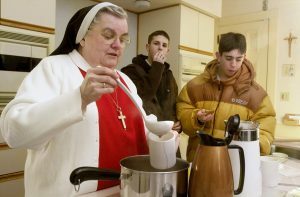 In this archive photo from 2002, Sister Mary Jo ladles out cups of hot chocolate and serves cookies to visitors who hung Christmas wreaths for the nuns at the Precious Blood Convent in Portland. The two nuns who remain at the monastery will move next month to the religious order’s monastery in Manchester, New Hampshire. The Sisters Adorers of the Precious Blood have lived in a monastery on State Street near Longfellow Square since 1934. The monastery originally housed 14 nuns, living in silence and prayer away from the world. But the Roman Catholic Diocese of Portland announced Monday that the two remaining nuns will move next month to the religious order’s monastery in Manchester, New Hampshire. The diocese did not elaborate on what prompted the move nearly 84 years after the Monastery of the Precious Blood opened in Portland. It is also not clear what will happen to the monastery itself. Property records show that the Sisters Adorers of the Precious Blood owned the property as of last year, and it was assessed at more than $960,000. The religious order was founded in 1861 in Quebec. 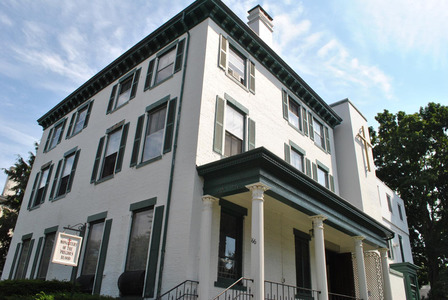 In 1934, seven nuns from Manchester purchased the William Pitt Fessenden House from the Diocese of Portland. It had been used as a school for girls and women who were taught by the Sisters of Mercy. The chapel at the property has long been open to the public. The Portland community has supported itself mostly through the sale of enrollment and Mass cards, which offer prayers for needs like a birthday or the death of a loved one. The diocese said the nuns in the monastery spend their days in both spoken and silent prayer, labor and some recreation. The diocese will host a special Mass for the sisters at 2 p.m. Oct. 4 at the Cathedral of the Immaculate Conception at 307 Congress St. A reception will follow in the parish hall at the nearby St. Peter Church at 72 Federal St.